The homeowners of this gorgeously renovated modern traditional style brick home built in the 1980’s spared no expense. This home is completely renovated from top to bottom with a twist — upgrading materials to suite the latest trends and spark home buyer interest. 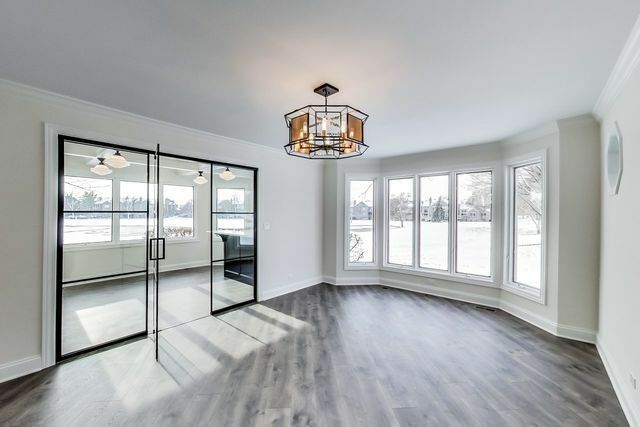 However, despite the property’s clean lines, glass partition, barn doors and trendy lighting the home lacked definition when it came to showcasing a home buyer’s lifestyle. How would you arrange the living room furniture? Can the dining table fit? Where can I put my home office? These are all valid questions that circle the mind of a home buyer creating confusion and doubt — that’s why it’s so important to stage a vacant property. Only 10-percent of home buyers can visualize the potential of a property, so how do you bring the 90-percent around to see your newly renovated vision? You hire a home stager. Chicagoland Home Staging was excited to tackle this property that sits on hole 17 of the prestigious White Eagle golf course. By adding a few key furnishings, our team can answer those buyers questions that could hinder a sale. With strategically placed furniture, they now know how to set up the living room. And the home office is just beyond the glass door. 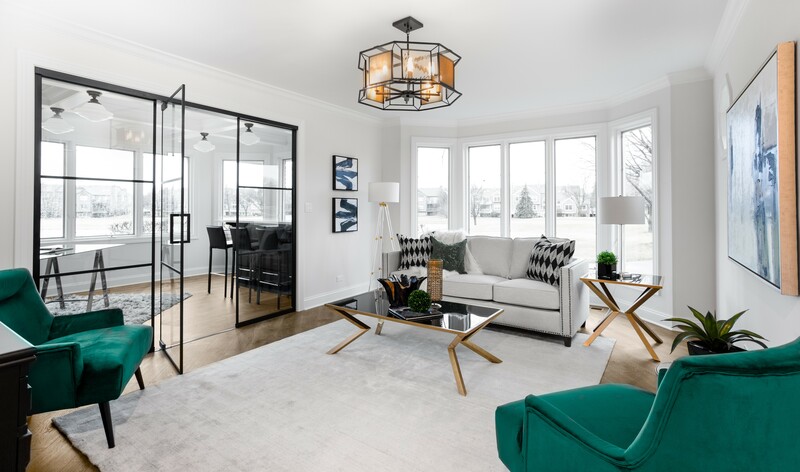 We chose updated materials like an acrylic floor lamp, black mirrored with gold legged tables and of course a pop of green to enhance the materials used in this renovation. 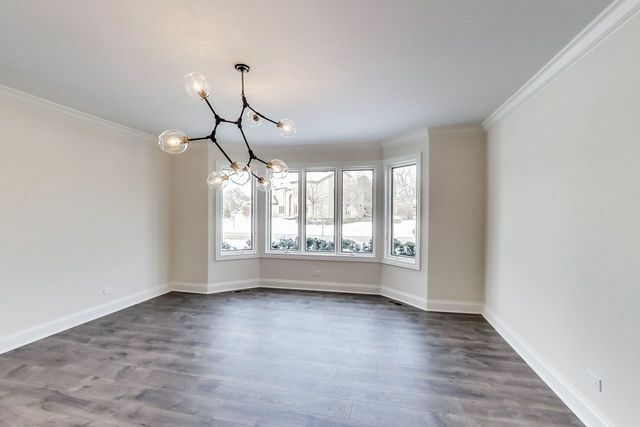 Our team loved working with this neutral palette and the modern globed chandelier directed the design of this space. 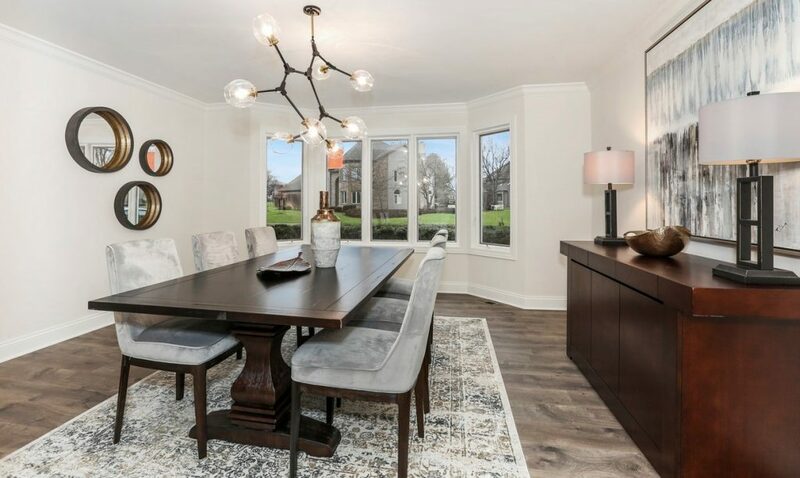 We wanted to highlight this dining room’s square footage while still showing off the picture perfect windows. We decided to go with darker wood furnishings to ground the room and bring out the brown in the flooring. Our team then mixed and matched beiges and grays to create a luxe feel. By using neutral hues we were able to keep the attention on the windows. We used six dining chairs at the table, however the set up allows home buyers to easily entertain dinner for eight. The dining room look was completed by using three circle mirrors that mimicked the lighting and reflected the windows. This home also had a wet-bar showcasing a highly desired trend, mixing Carrera marble with hints of gold. Notice the two-toned cabinetry using natural wood and white cabinetry. 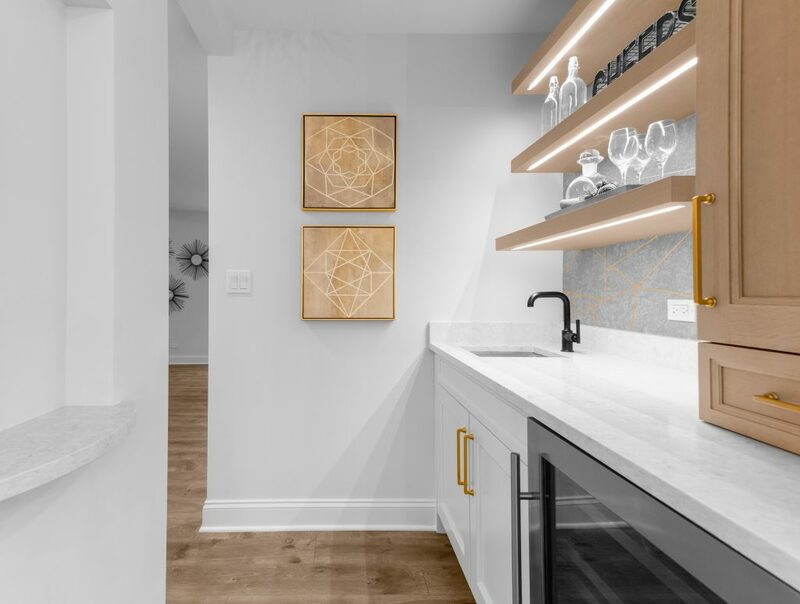 Our team add a few key accessories to display on the shelves and highlighted the materials used in this space by adding geometric artwork. The master suite was light, bright and spacious everything a homebuyer could want. The details in this room from the ceiling, to the chandelier, windows and barn door were important to highlight when it came time to stage. Our team used a large tufted headboard to balance out the closet wall, but kept the color neutral so it wouldn’t compete with the room’s features. Overall the room’s furnishing enhanced the layout, but blend in with the color scheme to let the renovated details speak for themselves. 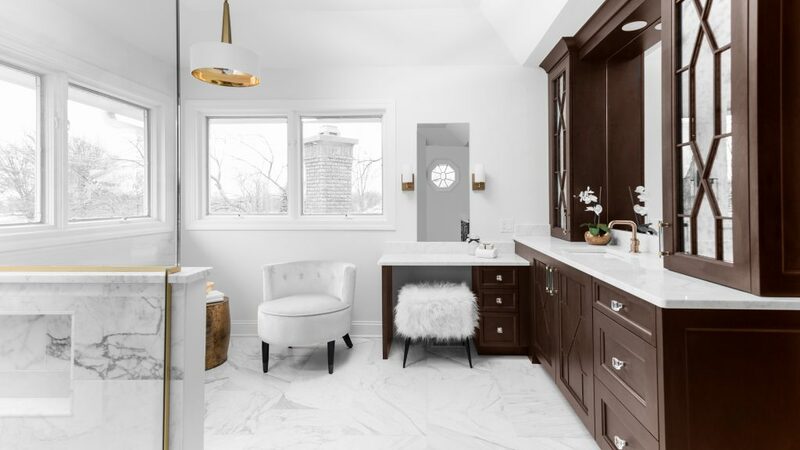 Of course the updated look of this home continued into the master bathroom — with more marble, rich-dark detailed cabinetry and a gold drum chandelier. Our team used spa-like accessories to complete the look to help create cozy features at every corner. 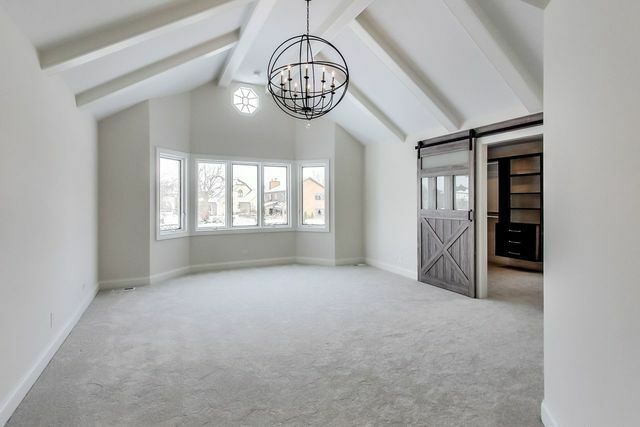 Need help staging your Naperville home, contact us today to learn more about our staging services. We can’t wait to hear from you!